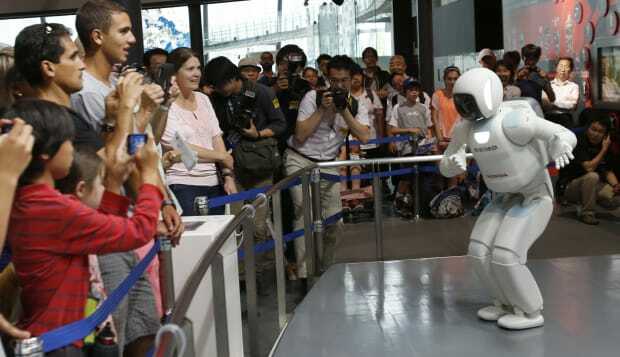 APHonda Motor's robot Asimo (which is not designed for retail store work) fields questions from a crowd of reporters. Retail workers are among the most at-risk for being replaced by robots. And the move to artificial intelligence could happen much sooner than we think, Doug Stephens, founder of industry website Retail Prophet and author of "The Retail Revival: Re-Imagining Business for the New Age of Consumerism" told Business Insider. "I fully expect to see Wal-Mart, Kohl's, Target, and other retailers making a very concerted effort to pursue the automated store in the next three to five years," Stephens said. "There has to be a breaking point where retailers say that people are no longer contributing to the business." He listed a few reasons why artificial intelligence could take over. 1. The technology exists. Hointer, a Seattle-based company, has developed robots that bring items to and from fitting rooms. Major corporations like IBM are also investing in artificial intelligence. "Robots are already working in healthcare to give test results," Stephens said. "If we trust them to diagnose diseases, why wouldn't they work in retail?" 2. The customer's "need to know." Since the advent of the Internet and smartphones, customers expect information instantly, Stephens said. Unfortunately, retail workers don't make enough to be educated on all the products in the store. Retailers can bridge this information gap by adding informational kiosks, or eventually, robots who can answer questions. 3. Retail jobs have changed. "Over the last 30 to 40 years, retail jobs have eroded," Stephens said. "These corporations have drummed out any intelligence the job requires so that the people working are little more than a glorified pair of hands for folding." The fact that retail jobs often require redundant, menial tasks means that these workers will be easy to replace. But Stephens cautions that not all retail workers should panic. He believes that high-end retailers like Nordstrom, Lululemon, and Neiman Marcus will invest more in employees in the future. "These companies have the margins and money to invest in their workers," Stephens said. "If you work in upscale retail, it's very possible that your wages could rise and you could support a family on this job."